Take and Share Wind Reports Anywhere! 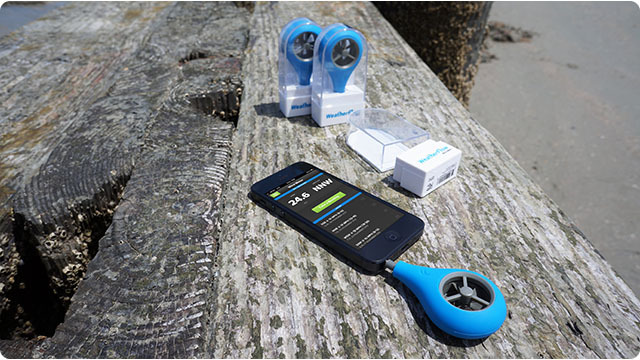 The Weatherflow Wind Meter is an anemometer that fits in your pocket. It works with Android and iOS devices like iPhone, iPod Touch and iPads. WeatherFlow is proud to announce the WeatherFlow Wind Meter - it’s an anemometer that fits in your pocket. It’s the first hardware product we have created for the general wind & weather addicted community. It’s compatible with iPhone, iPad, iPod, and all major Android devices. Not only do we have one of the most accurate and coolest handheld wind meters on the market, at $34.95 it’s also one the most affordable. So what are you waiting for? Get one now! Forecast maps including our exclusive WRAMS model outputs.